Heart disease, or coronary artery disease, is a result of improper function of the heart and blood vessels. There are many forms of heart disease. Atherosclerosis (hardening of the arteries) and hypertension ( high blood pressure ) are two of the most common. Fat deposits disrupt the flow of blood to the heart muscle, increasing the risk of myocardial infarction ( heart attack ). According to the National Cancer Institute, men are approximately 1.5 times as likely as women to develop colorectal cancer or heart disease. Both diseases may be prevented by eating well. 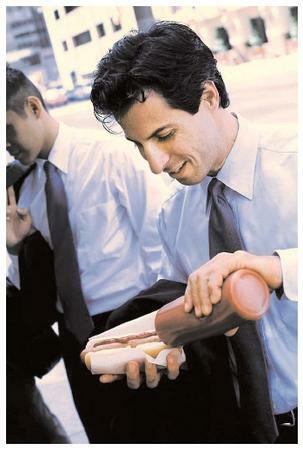 The convenience and economic appeal of fast foods, such as hot dogs, can lead to poor dietary habits. Heart disease is the number one cause of death for men. According to the American Heart Association, 440,175 men died of heart disease in 2000. Apart from just being male, other risk factors are being forty-five years of age and older, low levels of high-density lipoprotein ( HDL —the "good" cholesterol ), high levels of low-density lipoprotein (LDL—the "bad" cholesterol), hypertension, smoking, excess body fat, diabetes, and a family history of heart disease. SEE ALSO Adult Nutrition ; Cancer ; Diabetes Mellitus ; Heart Disease ; Hypertension .